Beanbag covers are in stock! Learn from master Trick Horse Trainers Allen Pogue and Sue De Laurentis how to combine classical concepts and modern methods to create a high school horse and the Ultimate Companion horse. Modern Trick Horse Training is about creating a more intelligent, predictable and adaptable horse. It is about training the mind of the horse and combining gymnastic moves that create physical strength and range of motion. An adaptable horse is a safe horse. Every student will have hands-on instruction with a large troupe of exhibition horses that vary in levels of finish. De Laurentis says, “This is a wonderful format as the students learn effective methods in a condensed time frame with no need to bring a horse. With the depth of skills you acquire in Camp, you can bring your new knowledge home and transfer it to your own horses”. You will have plenty of real-time guidance as you work directly with Allen and Sue..
Pedestal Training techniques both in-hand and at Liberty including two feet up, all four feet up, two-tier pedestals, the revolving pedestal and many variations. Tricks of Trust including the Obeisance and Bow. Tricks of Agility including the Jambette or Salute, the Rear, using the target board, the climbing wall and many variations on the pedestals. Tricks of Gait such as the Spanish Walk, the March Step and how to maximize individual gait variations. Tricks of Engagement including the Retrieve, herding and retrieving the big ball, and the smile. Liberty Training with one horse and then multiple horses, circus style. Imagine A Horse methods are modern and effective with an emphasis on equestrian tact, understanding how and why horses learn, and handler safety. Nuances of successful communication and performance will be applied to every situation. Red Horse Ranch has been thoughtfully designed to include a wealth of training facilities with specially designed equipment that each student will use to exponentially enhance learning. It also creates an excellent opportunity to try out different tools and spaces which helps each student discover favorites lending insight into how to plan their home ranch for continued studies, experiments and learning! Price is $750.00 which includes breakfast and lunch. Accommodations are close by or RV hook ups are available at the ranch. Contact Sue De Laurentis at: Sue@ImagineAHorse.com or call at 512-736-3208. Attendance for Camp is strictly limited so all will have plenty of personalized training. You're always welcome to book one on one (or couples) time with Sue and Allen or either one. We can customize class content and offer days that are specifically designed for graduates of past Trick Horse Camps. 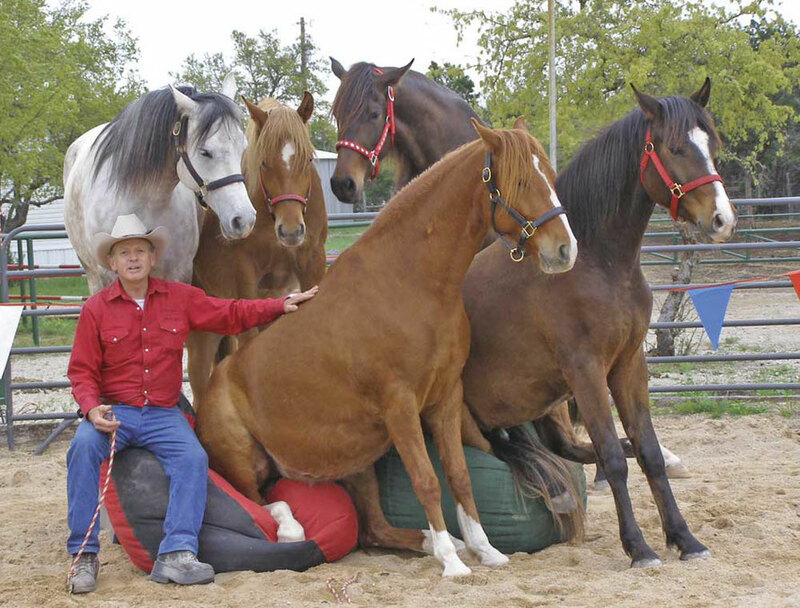 We can help you with specialized Trick Horse training and preparation for public performances. 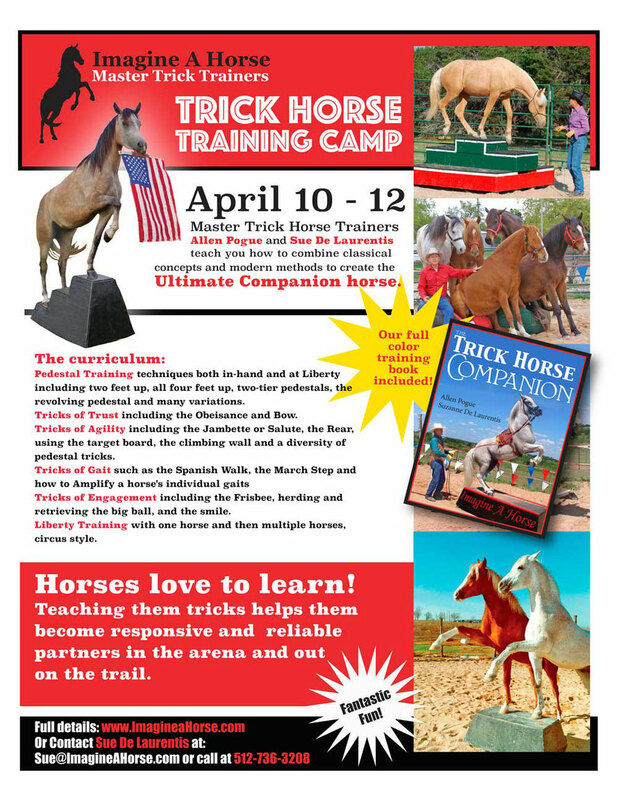 Share the fun of Trick Horse Training Camp with your friends! Just click the icons below. Deposit is non-refundable if you cancel your camp position.